The Cooper-White Group, led by Senior Group Leader Professor Justin Cooper-White, consists of postdoctoral research fellows with expertise in the areas of microfluidics, stem cell biology, polymer chemistry and biomaterials who are ready, willing and able to support the interdisciplinary approach to solving real world problems embodied by this team. Students hail from backgrounds such as bioengineering, material science, biotechnology, medicine, veterinary science, chemical engineering and general biology, and the training in this lab ensures that they continue to develop as scientists in both skills and outputs. The Group has offices and labs on Level 4 of the AIBN building with an impressive suite of lab equipment to facilitate the multidisciplinary research undertaken by this Group. Elucidating the microenvironmental cues that regulate stem cell behaviours and translating those insights into biomaterial scaffolds and microdevices to direct stem cell differentiation. 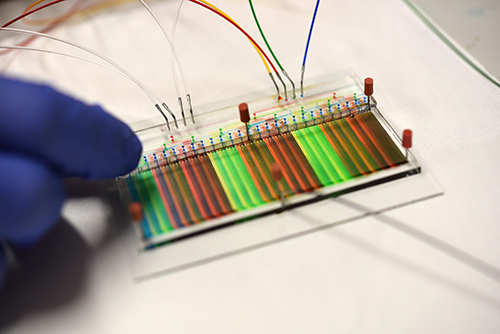 Researchers have developed a credit card sized device that enables cells to be cultured under thousands of different conditions simultaneously speeding up drug screening.